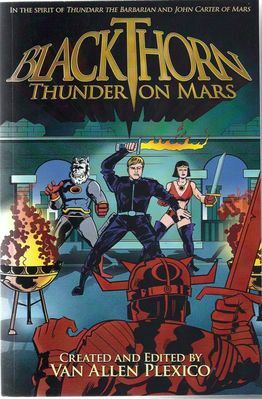 Why on earth would a writer/editor like Van Plexico want to take a 1980 Saturday morning cartoon television show and meld it with a classic Edgar Rice Burroughs fantasy series? The answer to that perplexing question is found in this book, which by the way, is the result of that odd pairing. In the introduction, Plexico tells of his love for an old Jack Kirby created TV series called “Thundarr the Barbarian” and how, for whatever twists of the muses, it seemed to plague his thoughts over the years. Enough so that he decided to one day do something with the concept, adding a new and fresh spin to the plot. It would be another few years for that final element of this eclectic brew would reveal itself to him when one day he started thinking of Burroughs legendary Martian series. Just like that the pieces were suddenly all there and when he mentally assembled them in his ever wondrous imagination, there he beheld the story of an American General who, upon his death in the Middle East, awoke to find his soul had been replaced in a brand new body; a body locked in the lab of a mad sorcerer on the planet Mars. Yet more revelations arise when this character, General John Blackthorn discovers his spirit has not only traveled through space but also time as this is a Terra-Formed Mars of the far-flung future. Within minutes of his bizarre awakening in his younger, stronger body, Blackthorn manages to escape the sorcerer with several other soul-transplanted fellows. In their flight, he eventually meets the beautiful, dark haired sorceress Aria and the fur skinned humanoid creature Oglok of the Mock Men. It is this trio, once met, that join forces to travel the amazing, fantastic landscape that is a post-apocalyptic Mars. Their further adventures are chronicled by a half dozen of the finest writers in new pulp today. Mark Bousquet, Joe Crowe, Bobby Nash, James Palmer, Sean Taylor and I.A. Watson spin exciting, fast moving adventures that pit Blackthorn and his allies against lizard men, battling robots and an ocean wide haunted valley from which no one has ever returned to name a few. Each story is a well crafted pearl in a thematic necklace of classical pulp sci-fi and brings Plexico’s dream to vibrant life before our eyes. It is abundantly clear that Plexico has tapped the mother-lode of adventure fiction with John Blackthorn and I can guarantee you we haven’t seen the last of him, or Aria and Oglok. One can only wait in breathless anticipation to see where on the giant Red Planet their travels take them next. Vivian Borne is an eccentric antiques dealer who lives in Serenity, a small Midwestern town situated on the banks of the Mississippi river. She lives with her daughters, Peggy Sue and Brandy. Together Vivian and Brandy solve murders that in one way or another deal with the business of antiquing. Which is the simplest way to describe this series, of which this book is the sixth and has been described by other reviewers as being a “cozy” series if anyone really knows exactly what that means. It is probably one of the smartest things I’ve done in a while. Why? Well simply because the book is so damn funny, I honestly couldn’t put it down. And the characters! Oh, my God, is there a more dysfunctional group then the Borne girls? Remember I said Brandy was Vivian’s youngest daughter? Well she’s actually Peggy Sue’s daughter. Yup. Echoes of “Chinatown.” You see Peggy Sue got herself “in trouble” as a young, unmarried girl and left her baby with her mother to raise figuring it was best for the child. Did I mention Vivian suffers from a bi-polar disorder and is on medication? Never mind that Brandy herself has a daughter….oh, forget it. Its way too complicated for me to keep track of after only one visit with this eclectic bunch. The thing is the writing is so clean and precise, even though you haven’t read those first five books (something I hope to one day correct) the reader just goes with the flow. There is a charm and decency to these characters that immediately grabbed me and had me caring for them from page one. Look, here’s what every true mystery fan knows as a fact, series fail or succeed not on how brilliant the crimes are staged and then solved, but on how appealing and original the heroes are. Don’t believe me, give this some thought. Early fans of Sherlock Holmes and Dr. Watson came to demand more stories from Arthur Conan Doyle to read more about them and not the mysteries they dealt with, those became incidental. The same can be said of every solid mystery series from Sam Spade, to Nero Wolfe and Nate Heller. In fact one of those famous shamus plays a huge part in this book’s climatic dénouement finale in such a hilarious way, I will not spoil it for you. It’s just too damn funny. Okay, if you really need to know the plot, here it is. Vivian and Brandy go to a storage unit auction, wherein the person who owned the unit stopped paying rental fees on it and the manager is legally free to sell its contents to recoup his or her loses. These auctions have become very common among antique dealers and I believe there is even a reality show based on the practice. So our two ladies end up winning the bid, begin transporting the boxed contents to their home and cataloguing them; everything perfectly normal and routine. Until they return to the storage facility for their second trip and find the manager dead in the now empty unit. The very next night someone breaks into Vivian’s home, attacks Peggy Sue leaving her unconscious and nearly kill’s Brandy’s loveable little blind poodle, Sushi. From this point forward, both Vivian and Brandy are on the hunt for the killer and how they go about it so entertaining, pages simply fly by. Sure, I was playing along and looking for clues too, but honestly, it was the ride I was enjoying to the max. 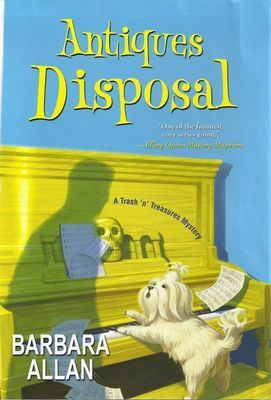 Bottom line, if all of the Trash ‘n’ Treasures Mysteries are as wonderful as “Antiques Disposal,” then sign me up for the long haul. Hey, even if you end up not liking the book, did I mention there are recipes for chocolate brownies in it? Now how can you go wrong with that? As much as most writers enjoy creating new series characters, eventually many of them, after writing the adventures of the same cast multiple times, start to feel the burden of familiarity. Add to the fact that each new volume often builds upon the fictional cast from allies to recurring villains so that eventually the poor writer is saddled with a huge ensemble that he or she feels compelled to include in each new story. These moments of repetitive angst seemed to be evident in Reese’s last volume of his Rook series. For the uninitiated, the Rook is a masked vigilante created by Reese years ago as his entry into the new pulp community and was an instant success among fans; this reviewer included. Still, by the sixth volume of that character’s exploits, the sheen of newness had faded and the Rook stories started becoming more about the supporting cast rather than the central hero. Like Arthur Conan Doyle’s ultimate dissatisfaction with his own creation, Sherlock Holmes, Reese somehow to be struggling to keep the Rook afloat. It was clearly time for him to move on to something new and with this collection, he has done just that in a most triumphant way. Lazarus Gray is Reese’s new hero and is an homage to the classic Avenger series, wherein we have our mysterious leading man aided and abetted by a team of loyal assitants; in this case a trio. Together they are known as Assistance Unlimited. 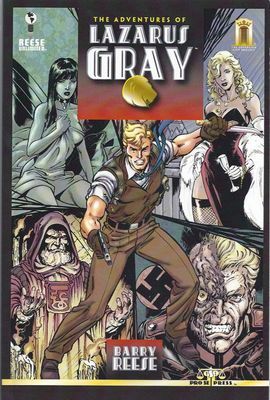 Although Gray’s creation was part of a shared world that included two other heroes, Reese clearly found his old muse with these new characters and has produced some of his best, most energetic and enjoyable fiction to date. These stories move at a breakneck speed and are filled with memorable characters and well delivered action to match anything done in the days of the old pulps. At the beginning of the volume, we meet an amnesiac washed ashore on the beach of Sovereign City with a strange medallion around his name on which is embossed the words Lazarus Gray. Within minutes of awakening, an assassin dressed as a police officer attempts to kill him, but Gray is more than a match for him and is the victor. Perplexed at his background, he assumes the name on the medallion and sets about creating a new life for himself as a champion of the underdog, the lost and impoverished while at the same time investigating his own unknown past. Along the way he acquires three unique followers: Morgan Watts, a once time crook, Samantha Grace, a blonde debutante with both brains and beauty and Eun Jiwon, a Korean martial artists. All three are fiercely loyal to each other and Gray for various reasons and always eager to go into battle with him. Reese’s ability to define this trio and breathe life into them is deft and although they do represent classic iconic pulp figures, he also injects original personal touches that sets them apart in a truly refreshing way. 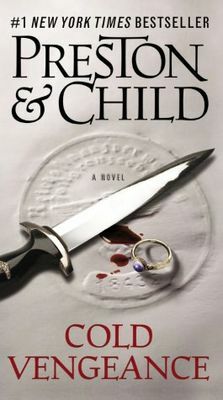 Having been a fan of the Rook series from the start, I had come to expect a certain level of quality from Reese. That this collection totally blew those expectations out of the water was one of the best surprises this reviewer has had in a long while. “The Adventures of Lazarus Gray” is by far the best work Barry Reese has ever produced and I predict will soon build an even larger fandom than that of his Rook tales. One point does require mentioning and that is the last story in this volume appears in print for the second time. It was first printed in “The Rook – Volume Six” and is a team up between the two heroes. I have no problem with the publisher reprinting the story, but a notice of such should have been made in the book’s indicia. Which brings about a minor goof because this story was clearly written before the others, although chronologically it appears last. In this book Gray discovers his true identity as being one Richard Winthrop, yet in “Darkness, Spreading Its Wings of Black” we are told he was Richard Davenport. Finally let me add this book is a gorgeously designed package with a wonderful cover by graphic artist Anthony Castrillo and superb interior illustrations by George Sellas. So what are you waiting for? Go pick up “The Adventures of Lazarus Gray,” you’ll be happy you did. You can thank me later. One of my favorite new pulp series on the market today is the Special Agent Pendergast series by Douglas Preston and Lincoln Child. I’ve stated many times in past reviews, if Clive Cussler’s hero Dirk Pitt is truly a modern take on Doc Savage, the Man of Bronze, then Pendergast is as close to a real life Shadow as we are ever going to get. What makes Aloysius Pendergast so unique is his expertise in both modern sciences and arcane mystical practices. First introduced in the book “Relic” the gaunt looking agent with the silver tinted eyes became an instant hit with action-thriller fans and rightly so. Over the years and in his multiple, totally mesmerizing adventures, the authors have parceled out stingy pieces of the character’s past life; most of which have dealt with his youthful days growing up in New Orleans. Now the pair has launched a truly masterful trilogy which delves into the one of Agent Pendergast’s most intimate and heart-wrenching experiences, the tragic death of his lovely wife Helen. With their opening volume, “Fever Dream,” we learned that her tragic death, while on their honeymoon safari in Africa, was in fact a coldly executed murder. By the end of that book Pendergast and several allies, including New York Detective D’Agosta, had run afoul of a deadly group of pharmaceutical doctors hiding on a foreboding island in the middle of the Louisiana bayous. In a climatic finale, Pendergast learned the man responsible for his wife’s death was in fact her own brother, Dr. Judson Esterhazy. As “Cold Vengeance” begins, Esterhazy, aware Pendergast suspects him, attempts to assassinate him while on a hunting trip in the forsaken moors of the Scottish highlands. But killing Pendergast is never easy and in the end the villain must flee, but not before revealing to the F.B.I. agent that the entire death of his wife was a ruse and that she is still very much alive. Thus begins the cat and mouse chase that propels us through this second chapter. Not only is Pendergast after Esterhazy, but he also launches an obsessive quest to find Helen. As both paths continue to frustrate him, what he is unaware of is Esterhazy’s own desperation has brought him to an immutable conclusion; the only way to stop Pendergast is to cease running and lure him into a trap. The frantic Esterhazy seeks the assistance of a shadow organization that has in fact been the manipulators of the past events and possesses a diabolic secret whose routes lie in the ruins of Nazis Germany. Reading this books is addictive, so be forewarned should you pick one up. You’ll soon be like this reviewer, hooked for the duration. “Cold Vengeance” is a riveting masterpiece of suspense skillfully balanced with pulse-pounding action galore. The only negative point is how fast one arrives at the cliff-hanger ending, which is pure torture. The third and final chapter of this saga is entitled “Two Graves” and for this reviewer it just can’t get here fast enough. Punch. Block. Counterpunch. Duck. Uppercut. Jab. Haymaker. Clinch. The staccato machine-gun lingo of boxing that taps across the brain like a dance choreographed by battling gladiators. It is a ballet of flying fists, controlled mayhem performed by all manner of combatants with something to win, prove or defend. Of the entire classic pulp sports genre, the boxing magazines were by far the most popular and prolific. Now a group of today’s finest new pulp scribes have come together to recreate the blood, seat and tears of those canvas arenas in a series of short novellas under the guiding hand of accomplished novelist, Paul Bishop. Bishop has an extensive resume from his long career as a police officer then detective for the Los Angeles police department, television and movie scribe and finally mystery/crime novelist. Recently he’s gotten into the new pulp movement and it’s clear by this tale just how much he loves the old school boxing tales. This story has the atmosphere and feel of an old Warner Brothers black and white flick from the 40s & 50s and one can easily envision actors like Spencer Tracy and John Garfield in the roles of his characters. It is that evocative of the time and setting; L.A. in 1954. Through a series of fateful events stemming from his boxing prowess, Flynn is recruited by Chief Parker to help stymie mobster Mickey Cohen’s plans to infiltrate the boxing world via his heavy-weight fighter, Solomon King. If King can whip Archie Moore, the reigning champion, then Cohen will have established a foothold in the city as well as the sports community. Something Parker obsessively vows to stop at any cost; including making Flynn a detective in his elite team providing he becomes a professional boxer and takes defeats King. No small tasks any way you slice it up. What follows is a thoroughly enjoyable, fast paced, knowledgeable yarn that was a pure joy to read start to finish. Bishop never misses a beat; again, knowing his melody by heart and relishing every single sentence, paragraph and chapter like a superbly orchestrated fight strategy. 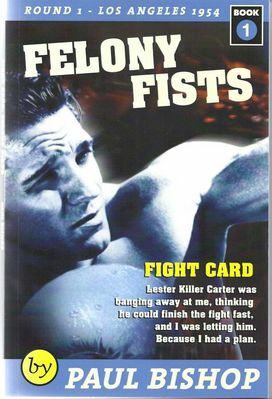 “Fight Card: Felony Fists” is a sensational opening to what this reviewer expects is going to be a truly amazing series that will revitalize a classic pulp genre in a bold new way readers are going to love. Me, I in his corner all the way. Last year well known fantasy author Charles Saunders delighted the new pulp community by releasing his novel DAMBALLA, making it the very first pulp novel set in the 1930s to feature an African American hero. Just this week that same book has been nominated for the Pulp Factory Awards of 2011 for Best Pulp Novel. Of course good ideas often emerge simultaneously amongst multiple creators and this was the case here. While DAMBALLA was making its big splash from its widely respected new pulp publisher, Airship 27 Productions, another hard hitting new pulp thriller was debuting from a little known outfit called Beating Windward Press. This one also featured an African American avenger operating in Harlem, only this one was set in 1926, the heart of the Roaring Twenties. Written by California based Dale Lucas, “Doc Voodoo” shares several iconic similarities with Damballa to be sure, yet there are also enough differences to define each hero as unique and original in the world of pulpdom. The hero is a World War One veteran of the famous Harlem Hellfighters 369th Infantry Division named Booker Dubois Butler Corveaux, a practicing M.D. known in his community as Doc Dub Corveaux. Raised in Haiti and having traveled the globe during his service years, Doc Corveaux is well versed in the Voodoo Religion and has become the physical agent of three powerful entities who, when possessing his physical body, imbue it with supernatural abilities that make him virtually indestructible. Thus in this state, he dons the garb of the Cemetery Man, black clothes, twin .45 automatics, magical clay bombs, a top hat and white painted face to resemble a skull. This frightening entity has assumed the mantle of Harlem’s protector and as we learn in this first book, she needs one desperately. Two rival gangs are battle for control of the streets and the action is focused on a tough minded woman known as Queen Bee attempting to open a posh speakeasy called Aces & Eights. Her opponent is a sadistic gang lord called Papa House who will do anything to ruin her plans even if it means unleashing a terrifying magic to corrupt the entire neighborhood and bring about untold suffering and misery. Into this vicious contest comes the Cemetery Man, guns blazing, determined to thwart that black magic and save the innocent souls caught in the crossfire. Dale Lucas is a superb writer with an eye for period detail. His research is meticulous and he knows New York from one end to the other, painting a virtual setting that is truly authentic for its period. His command of slang and mood of the times pulls the reader into a world in flux, a world caught between the past horrors of the first world conflict and the heady exuberance of a social order challenging the mores of the future. And like any classic pulp tale, the pacing is fast, the characters brilliantly etched and the action non-stop. This is a true page-turner that will have you cheering with each new gun battle, from this new pulp hero’s first appearance to his last. And Lucas wisely leaves the finale open ended for many more sequels, all of which we eagerly await. 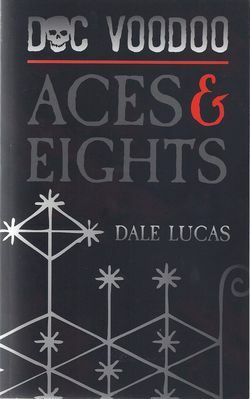 “Aces & Eights” is as good a pulp actioner as any other there on the market today. It’s one and only flaw is its packaging. Most new pulp publishers are aware of the demands of the genre in regards to marketing. True, one cannot judge the contents of a book by its cover, but then again, one can’t sell a good book with a bad cover. “Aces & Eights” isn’t so much a bad cover as a non-existent one. The tiny image of a white skull and a little color design manipulation do not make a great pulp cover. I would argue this book would have won lots more attention had it sported a traditional pulp painted front, visually debuting Doc Voodoo in full regalia, guns firing away. So please, Dale Lucas, if you do indeed have more of his wonderful adventures in store for us, give your packaging the extra attention it really deserves.